1997 was a pivotal year for Taku Sugimoto. He recorded two more albums in the first half of the year, further honing the gentle aesthetic he’d been increasingly exploring on his other recent projects. Though the electric album Flagments of Paradise was released first, Opposite, which featured Sugimoto solo on both acoustic and electric guitars, was recorded a couple of months earlier, in April 1997. The album, Sugimoto’s definitive statement up to that point, also became one of his most widely known. The Swiss jazz/avant label Hat Hut put it out in 1998 on their shortlived hatNOIR imprint – alongside somewhat similar work by underground guitar legend Loren MazzaCane Connors – giving Sugimoto his first real exposure outside of Japan. 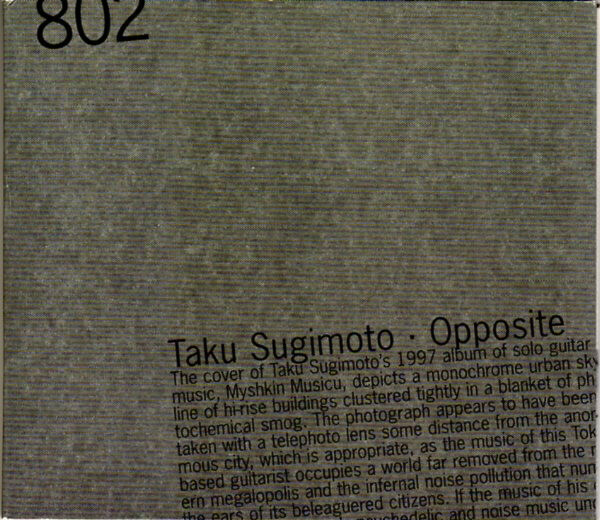 Like some of Sugimoto’s other work from the era, Opposite‘s 20 tracks encompass a wide range of styles and techniques, from warm, rich strumming to high-pitched electric tones to minimalist pieces where solitary notes are surrounded by chasms of empty space. Unlike those oft-tentative early works, though, Opposite is fully realized and coherent, a dazzling and confident display of understated virtuosity, with not a note wasted or out of place. What’s most immediately striking about Opposite is how inviting and, frequently, beautiful it is. Each piece is an evocative miniature on which Sugimoto toys with melody and song structure without ever allowing his rambling to fully cohere into recognizable forms. He retains a sense of abstraction even at his most melodic, and vice versa: the result is this incredible feeling of being perfectly suspended and still, in the midst of music at once aloof and alluring, perfectly structured and structureless. The disc maintains an overall mood throughout, but Sugimoto varies his approach quite a bit from one piece to the next. On “Midnoon,” softly cascading electric guitar tones wash over one another, creating a sensation like careful footfalls in shallow water. The brief next track, “Opposite,” features harsh, spiky plucking, while “Subtle” is one of the most melodic and straightforward pieces here, a lovely little tune that represents one of Sugimoto’s closest ventures toward more Connors-esque bluesy territory. Later, on “Paris,” Sugimoto returns to the high-pitched, popping, crackling electric tones that he’d earlier mined on pieces like “Kira” from Myshkin Musicu for Electric Guitar. The always restless guitarist never sticks to one mode for long. But where his restlessness had seemed like uncertainty on earlier albums, here it’s evidence of an artist who has cultivated a wide palette of effects and is applying it, judiciously, within the confines of a comparatively narrow aesthetic. There’s plenty of space here, as Sugimoto frequently allows moments of silence to stretch out, only playing again when the previous note’s reverberations have fully subsided. The result is music that feels calm, patient, even when Sugimoto’s bending his strings more forcefully and plucking out harsher sounds. Even the spikier pieces feel deliberate, each “wrong” sound carefully placed. The result is a very curious album, this beautiful work that’s quietly gnarled with tension inside. Even when the music approaches lyricism, as it frequently does – Sugimoto’s playing can be downright gorgeous – there’s this distance to it, this chilly sensibility that suggests the guitarist archly eying each note as it drops from his instrument, watchfully ushering it into its proper spot. The music, though so outwardly gentle, resists being fully embraced for its beauty alone – one has to also accept the moments when scratchy little pinprick tones ring out, or when the strings jangle from being plucked too abruptly. The second track “Bells of…” is a perfect encapsulation of Sugimoto’s prickliness. Between long gulfs of quiet, with only a steady bed of tape hiss, Sugimoto suspends a variety of single tones: sometimes a warm, rounded note; sometimes a sloppily strummed chord with his fingers squeaking against the strings at the end; sometimes a sudden burst of buzzy noise. Though the music is slowly paced, utterly patient, and generally quiet, tracks like this unsettle the surface calm with the unpredictability of their details, rewarding close attention by unveiling the wealth of nuances and variety within Sugimoto’s playing. He gets so much texture out of such seemingly simple tones, all these little quavers and incidental buzzes from fingers lightly brushing strings. The acoustic tracks, especially, are extraordinarily tactile, and the lovingly detailed recording helps call attention to each touch. It’s been over 20 years since Sugimoto recorded Opposite. In some respects he’s become a very different artist in the intervening decades, heading down some unexpected paths. Still, the patience and the craft he mastered here have very much remained vital to his sensibility through all his transformations, and Opposite‘s tense, oft-prickly beauty remains a key text in understanding his music. Even more importantly, the years have not at all dulled this music’s subtle power. This entry was posted in 1998, eai, free improv and tagged Hat Hut, Taku Sugimoto. Bookmark the permalink.